I have a large house block - 2100 sq M. (which is just over half an acre). When I first came here the immediate need was for a fence that would keep my dog and cat at home with me! The easiest and cheapest was a good high wire fence which I then proceeded to hide with a lot of perimeter plantings. After 12 years here I now have lovely green walls that keep growing. One side is now a hedge of Lilly Pillies (Syzygium smithii) which has to be trimmed regularly! 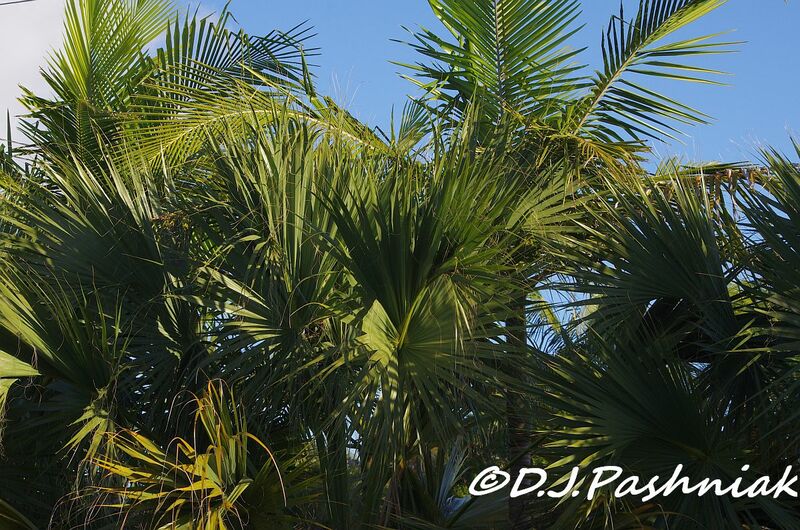 I liked the look of palms and in this climate they grow well. I now have three sides covered with palms. Most have grown well but some few have not survived. When I checked the names of these palms I see that most of them can be grown in pots but they love the outdoors and grow to heights never seen with little pot plantings! 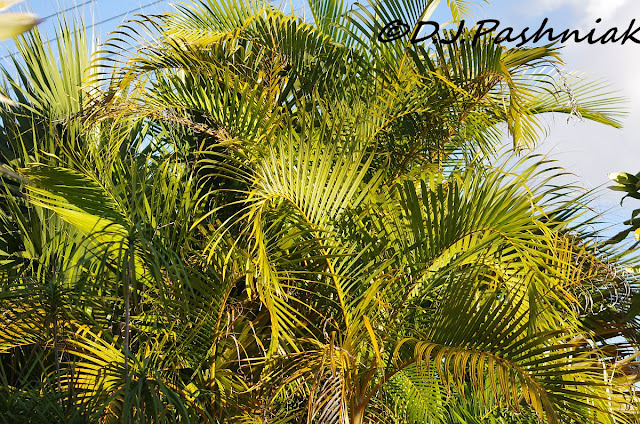 The easiest to grow have been the Golden Cane Palms (Dypsis Lutescens). These are clumping palms and keep on spreading unless you cut back the new small ones. Most of mine are now between 2-3 meters high. 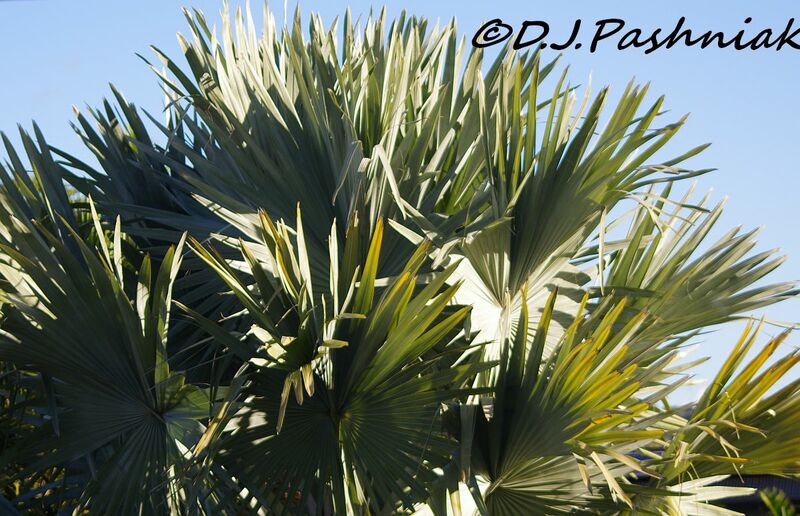 The palm that I like the best is a beautiful silver green color (Bismarkia Noblis). It has a single trunk and can eventually grow to 12 meters. This was the most expensive palm to buy so I only have a few scattered around the garden. Another palm which has grown very well is the Sabal Palmetto. I planted these among other types of palms to give the effect of a palm grove. It was in this area that some of the other palms did not survive. I think the Sabal Palmettos just choked the growth of the others. However, all the higher growing palms did survive and now give an interesting height variation to this area. The only problem with palms is that there are few things to attract the birds. 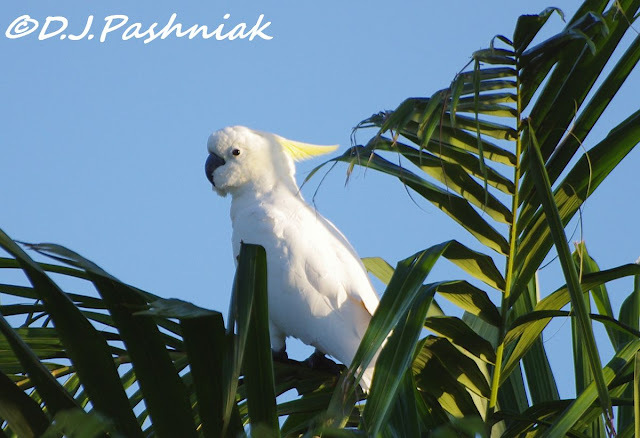 The white Cockies (Sulphur Crested Cockatoos) are the exception as they come in and cling to the highest fronds and then proceed to tear them apart! Oh, I do love your beautiful birds, Mick, and such terrific captures!! Thanks for sharing, as always!! Hope you have a great week!! Sounds a bit like Hitchcock's film 'the Birds'. Wow, I am glad you came to the rescue of your kitty. The birds are beautiful,it is a shame they are so mean! I love the palms! Great photos, enjoy your new week! Would love to be able to grow large palms like yours. One angry bird is enough! A few days ago a male Blackbird was chasing Penny round the back garden. There must have been a youngster nearby. The sight of a small bird chasing a large greyhound was funny to observe and unusual as Blackbirds normally just create a noisy fuss. Great post, when all the birds make a lot of noise around here we look to see where the cat from next door is. Gorgeous photography! Love the 'feathered friends' ~ beautiful! I recognize some of those palms, we have then here on private properties but it's the birds I'm loving more than anything, is that a cockatoo? Wow - that is an angry bird! Lovely shots! We do have a few palms growing here in Lancashire but only in the most sheltered spots from the west and north west winds. Birds have to be good at spotting predators and although your cat might not be a bird killer lots are. Mostly I see birds ganging up on birds of prey and owls. While hawks and falcons tend to quickly fly off, owls have a habit of just sitting there while dozens of birds join in the mobbing. Beautiful birds, but it does sound scary. It reminds me of Hitchcock's movie. Wow, I wouldn't want to mess that bird. Looks fierce. I loved this true story! And your yard must be wonderful. Poor kitty though! We used to have a Siamese who got tormented regularly by Scrub Jays, but they left when we hollered! I think your birds might very well have carried you off if there had been a few more of them! The palms look familiar.... The Sabal Palm is very common around here. Now all that action between the birds and the cat would have been really great on video. Poor cat! A lovely garden you are creating. Those Honeyeaters are handsome but rather fierce-looking. Aggressive little honeyeaters! Poor cat! Love your palm "hedges"! Archives are fine when the birds look as cool as the last one! 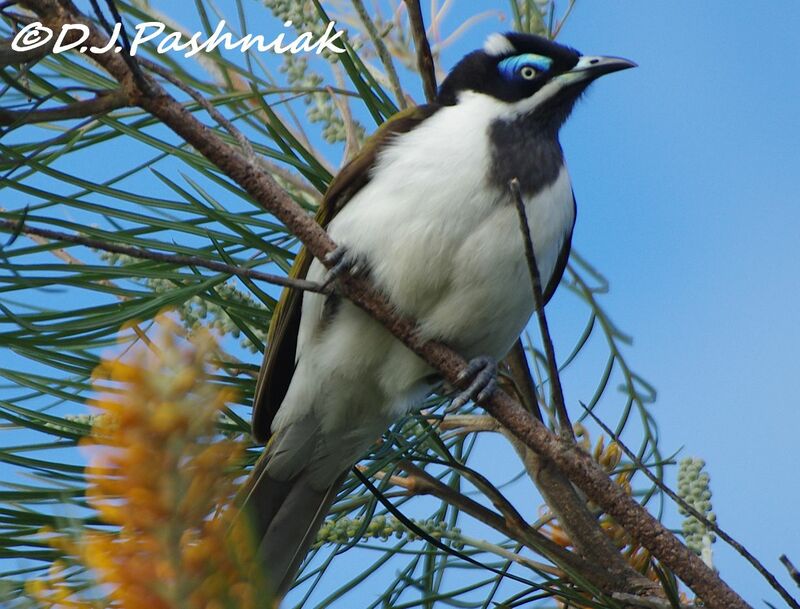 We could do with your Blue-faced Honeyeaters to keep the neighbours dog out. We never see the S.C Cockies in our yard but we get the Y.T.B Cockies. They decimate the Proteas every year but they just grow back better than ever. Your garden plants don't look much like mine! 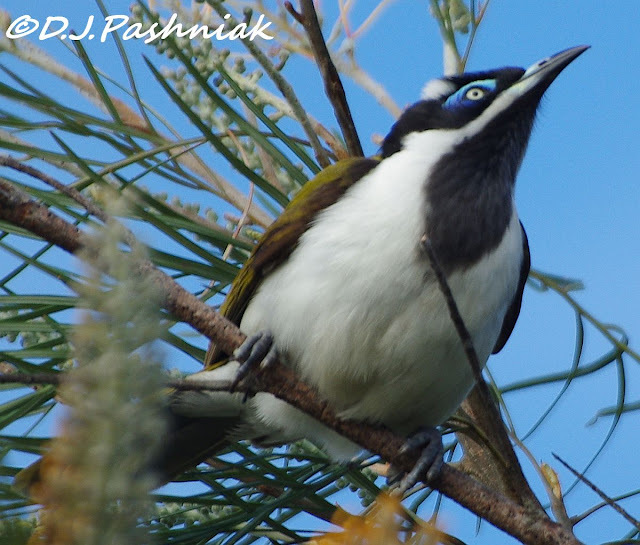 And I think I would have a yard full of birders if the honeyeater showed up! Trying to catch up on visits and comment while I wait for a flight - one busy week to go and it's back to normal! You have a great yard. Beautiful birds!